ACTION Unbuffered action, usually small time-window! Action>> From default target, "press Right twice"
Try not to take allowance money. Grab the pendant before talking to Marle. 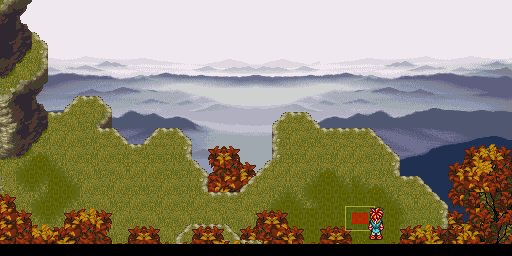 (Caution: you can talk to Marle while still lying on the ground.) This helps achieve Guilty verdict. Talk to Blue Tent vendor (at Fountain). Hold Up+Left to retrieve pendant from the Telepod. To consistently open Powerglove chest, slide Down+Right against the small vertical wall, until you're stopped by the chest. 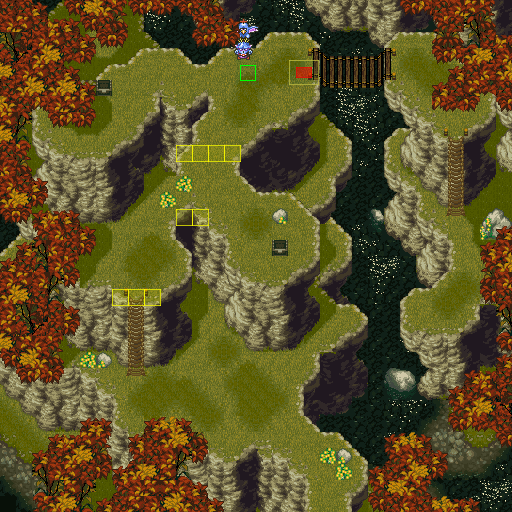 Buffer Dash+Left out of the Gate to avoid getting "Magic Pixel" (Crono's position off-centered on the grass). 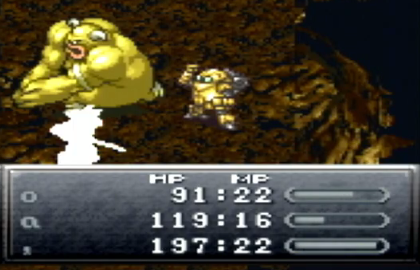 This causes right-side Imp to attack Crono sooner, but that doesn't matter for current strats. 1. Push against the top of the bridge. 3. If you end up as shown below (1px away from good position), you can try the "Reverse Pause-Buffer" (to cut the Left-input short): press Left+Pause,Unpause. Otherwise, it may be a good idea to step back to the Right, and try again. 4. Buffer Run and run straight Up, to clip past. Pick up the Hairpin without talking to the nun; fight Nagas. Use the left stairs. In the left side-room, stick to the right (bat hitbox only goes left of the red); skip the switch. At top, avoid the red carpet; go above the rolling Hench. Use switch in right side-room; the Diablos have no hitbox. The slide hitbox is at the top of the slide, so hug the rail at the very top. Buffer to run Down to "mid-section" (middle of the between-stairs area) to cancel "Prepare yourself"; keep Leene in view. When Leene turns around: Down to "red edge" (edge of red carpet), then back Up the lower-stairs to view Frog. When Frog kneels: Down to "red square", then back Up to mid-section to view Leene. 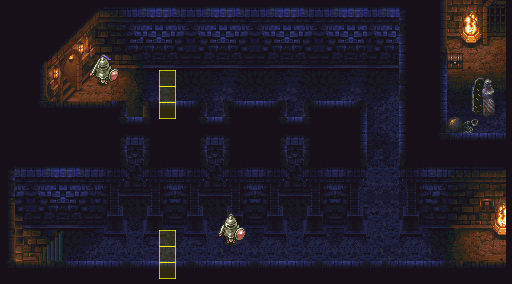 When Leene lowers face: Down to red edge; get Midether chest then stand at top of upper-stairs. When Chancellor hops twice: Down to mid-section, then back Up the upper-stairs. 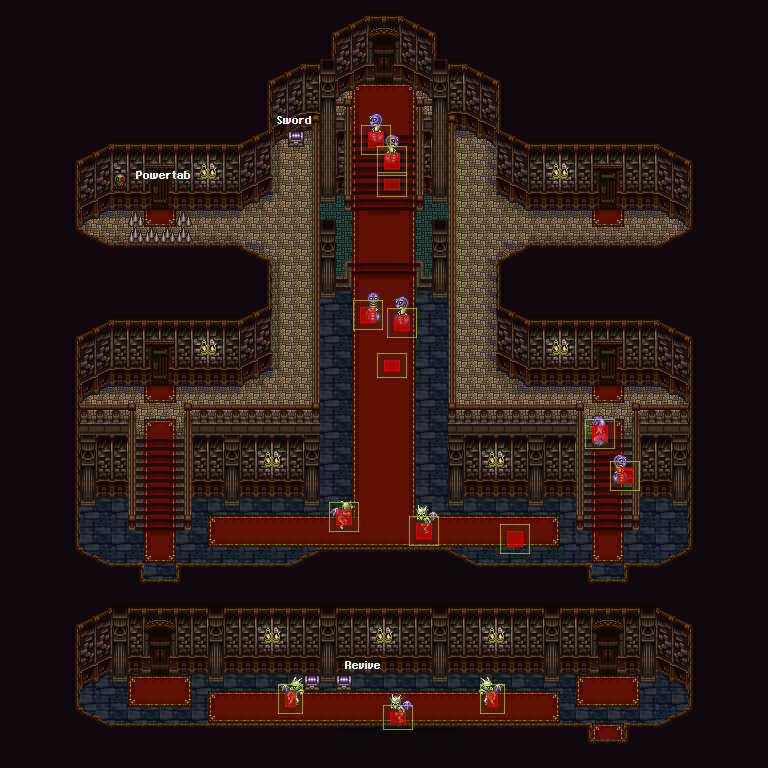 When Chancellor crosses halfway in front of altar: Down the lower-stairs and then Down to red edge; open Chancellor's chest then stand in front of Yakra. Push Up against Yakra repeatedly in attempt to accelerate his transformation (try to stay out of the middle of his sprite). When Yakra stands up: retreat down the lower-stairs before closing the "Reverts" text! Save & Load: Mash . . . 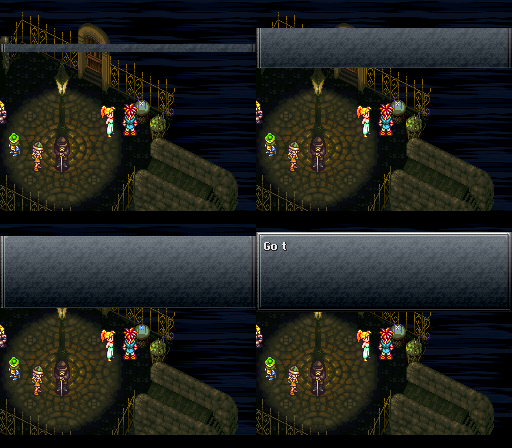 When Chancellor approaches Crono, answer "Marle did" (2nd option). If you mash through, it's ok, but you'll get Not Guilty. Hope that the 2nd Juror says Guilty (goes leftside). 47% chance. Get up close (see yellow markers), and wait for 1st guard to face Right (he can change facing every 24 frames). Take Midtonic. Wait for 2nd guard to face Down (he can change facing every 48 frames). If he's already facing Down, you can go when he "stumbles". Take Midtonic. Beware of this door trigger! If you're Running, and your pixel is misaligned, you won't be able to touch the trigger. Let go of Run and walk into the door. Set: 2 Powertabs, Steelsword, Powerglove, double-bright load. Set: 3 Powertabs, Steelsword, Powerglove, mash load. Run Up and mash to open chest. The rat will be obstructed by party members and "chase" you upward - face the rat and tap A a couple times (while the treasure text is opening) to interact with it. If your Menu button is X: menu now change controls! Be sure to interact with the body, after the forced cutscene. Else rat race won't spawn. Take the 1st stairs immediately, and at the 1st (lowmost) bug stay against the bottom of the stairs. Clearing all the bugs without waiting isn't too difficult. "Midcycle rat" - the rats may get in your way at the end, but it is possible to sneak between them. Otherwise, be careful that you wait for them to pass. Activate computer from left side. Stay above across the first 2 (of 3) "room-dividers." Hit left-side of door and go down through side hall. Stay below along the bottom hall. Buffer all the face buttons together <A><B><X><Y> to input the XABY password. The pattern of 5 reds/greens is determined by the frame (1 in 60) you enter the room. often 1-shots. Kill a green hiding with reds! often 1-shot. Kill green hiding with reds! 1. 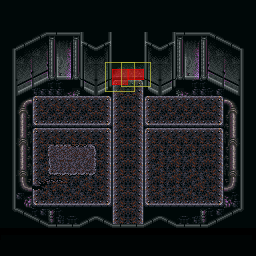 Buffer Dash Up+Right into the room, to obtain a small "breakaway" (you'll notice P2 and P3 aren't aligned with Crono anymore). Wake up Gaspar and run Left+Up over the bridge. 2. At the middle of the bridge, Gaspar's text will begin to close: open Menu quickly to interrupt it clearing… Close menu (buffer Start+B to do so), and begin holding A. Move only across the top-most pillar (to "collect" it); cease holding A. 3. Push Left to tuck yourself above the heal bucket. Run straight Right tot the lamppost, then Walk straight Left until stopped by the heal bucket. 4. Tap A, and pause-unpause to try to hit a good frame. If you manage to pause on a good frame, press Start+A exactly together (there's some leeway to it), and hold A to close the text (600AD). Go to "Truce Canyon" 600 A.D.? Yes. No. 5. 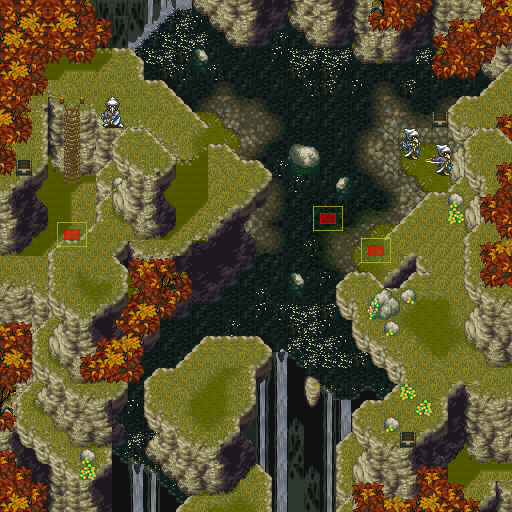 Watch P3's position compared to Crono. 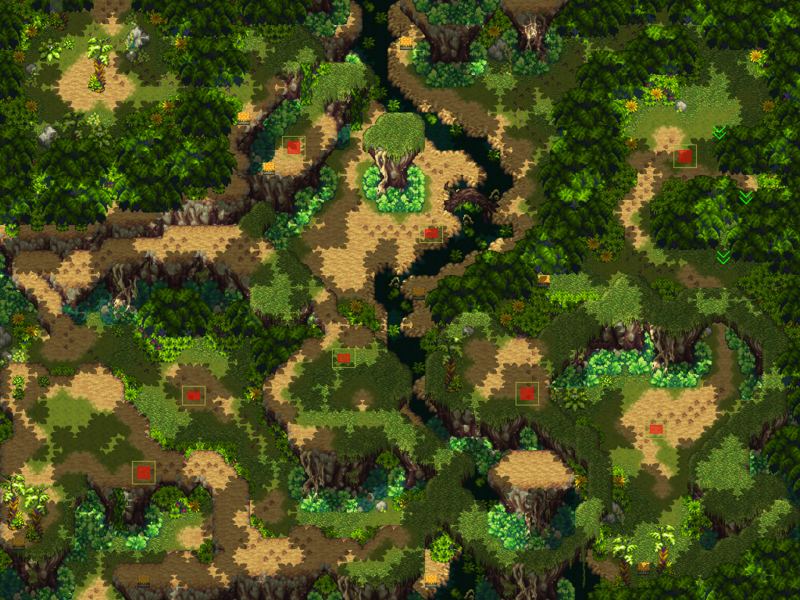 Right when P3 groups up, Crono will face down and begin to zip Up+Left. Try to anticipate this and open menu immediately when it begins (you need to hear the shimmer or see movement). Swap Lucca & Robo, to cancel his zip. 6. 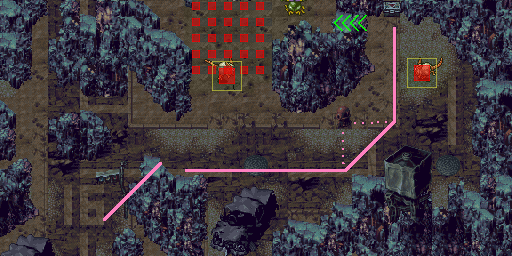 Depending on how early you cancelled the zip, you now need to run around to the savepoint and stand on it (with decent time before the screen transitions, else the savepoint won't grant Saving Status). BEFORE the room fully loads, "buffer" (i.e. Be Holding) Dash+Left. The trigger we're bypassing cycles every 28 frames, beginning from room-load. We're trying to run across it at a moment when it takes especially long to halt player control. The setup is to Run Left the entire distance, but subtract only 9 frames (by Walking, for 9 frames). You'll need to dodge the 3 NPCs. If you get "stuck" on them, you'll lose too many Run frames. Luckily, you can pass behind most of the Knight Captain's sprite (if you do not move too far Up, the dodging goes a lot easier). Run Down+Left to push against the side of the bridge, and open menu while Running. When you open menu, you can check for the cues below. (It's fine if you menu too early! Simply close menu, and continue Running PLUS Mashing menu to reopen it). If you save 3 tiles west of your start position, then only a 1-Tap is needed if you reload. Buffer Left+Up: Miragehand is immediately behind the leaves. To manipulate Masa & Mune, all fights must be avoided. Stay low entering the room. Outrun the Free Lancer. Stay above; climbing the ladder, buffer Right+Up. These fights can't be escaped from. Buffer UP entering the room! If you press Left too early, there's a whole fight-gauntlet (reload). Buffer Up+Left entering room. To be sure of the skip, push the right-side wall (walk against it); from high enough up, Run Left so that you will clip against the slope. Move up at the sparkling water. Alternatively, hug the lower side of the slope. After the ladder, clip down the left-side. "Fast Bird" is when you fall down the ladder but the camera doesn't pan: you can immediately Run Right+Down behind the Goblin, and don't need to wait for a Rock-thrower cycle. It's a 1-in-4 framer (the frame you fall down the ladder): shoot for it by hitting the ladder barely (i.e. 1 pixel) off-center. Otherwise, stay to the left, and wait for rock-throws before proceeding. Hit right-side of the stairs for Luck. Lucca can be Left, or Right : check for elbow/gun covering nearby shadows? Backup: Bright load . . . The 2 frogs near the entrance are safe. Sometimes a Nu appears (16/60 chance). Near the upper Snake, make a habit of moving the Left around the rock; there's a 1-in-60 this Snake has troll movement. 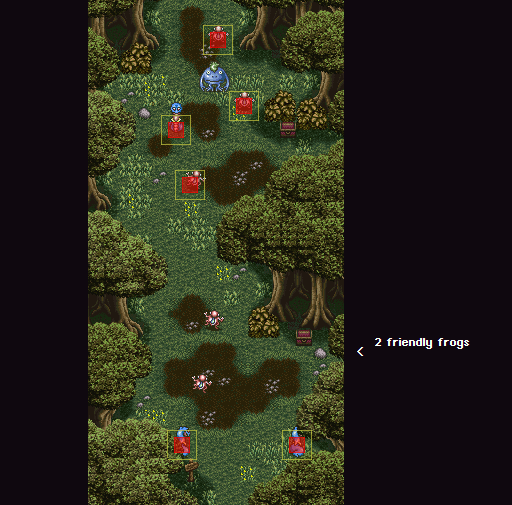 Returning from Frog's den, buffer Left+Down, and the bush the won't obstruct you. The entrance-frogs being safe, run Down+Right against the bush (beside the chest) to align, and run straight Down, to cleanly dodge the Snakes. 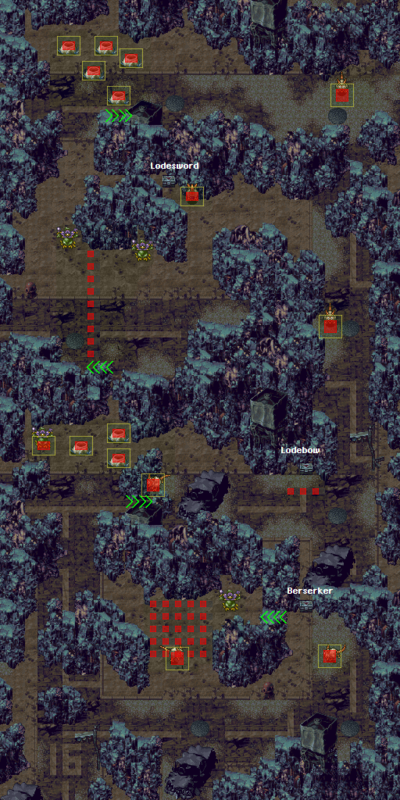 Get Reptites into battle position by closing 2nd dialogue within 8-frame window. If your TV has none of the right-edge cut off, you can press A just as Reptites "kiss" the right-edge of the screen. You can also watch Lucca raising her glasses: count and press A on "6,7,8,9"
Swap in Robo at any time! Cue for Reptite positioning: Close texts when guy "kisses" right-edge of screen (twice). Caution: perfect mashing will initiate fight before Reptites are in proper position. 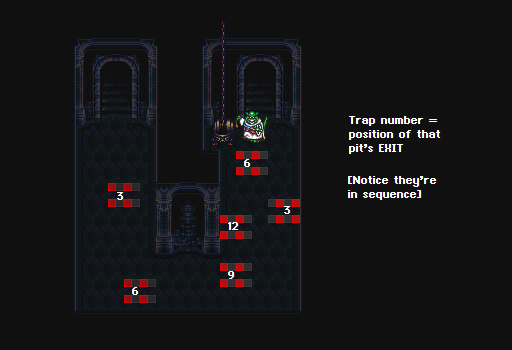 Mash your Action button through all the text, but you must mash literal <A> for the minigame. 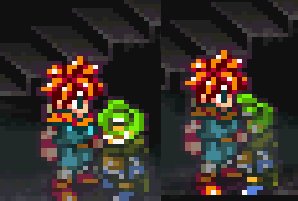 Each time Crono puts the bowl down, you can rest briefly. You need 8 "bowl-downs" to win. "Up-and-over" the 1st vine, 2nd vine, "rock tree," and bridge. Note fight triggers 1 & 2 if you go too far down. Triggers 3 & 4 are wide to your left. Trigger 5 is quite close: "clip" down the rightside wall. 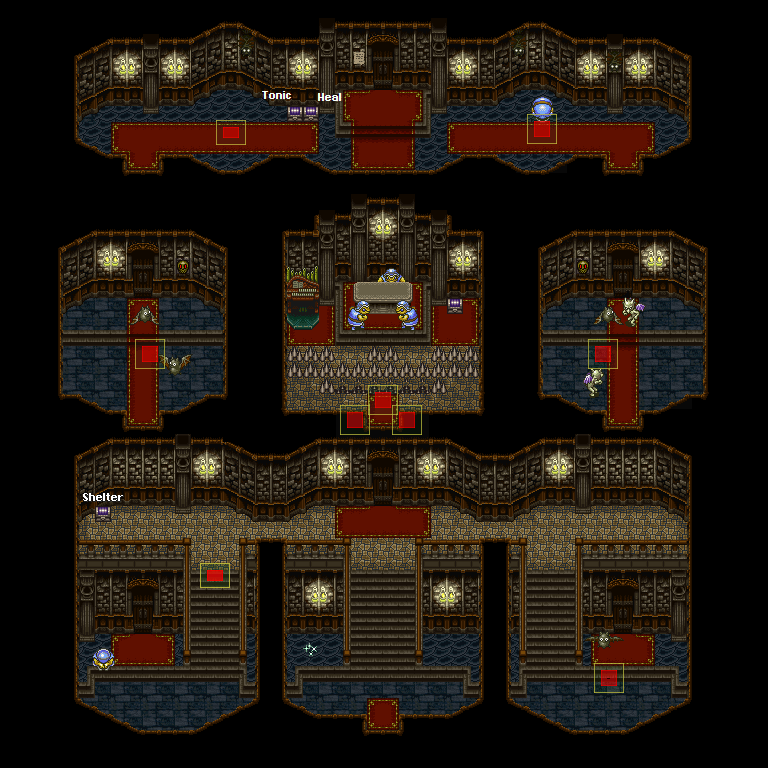 If you forget Ayla's Rubyvest (for Frog), you will miss it in Magus Castle! 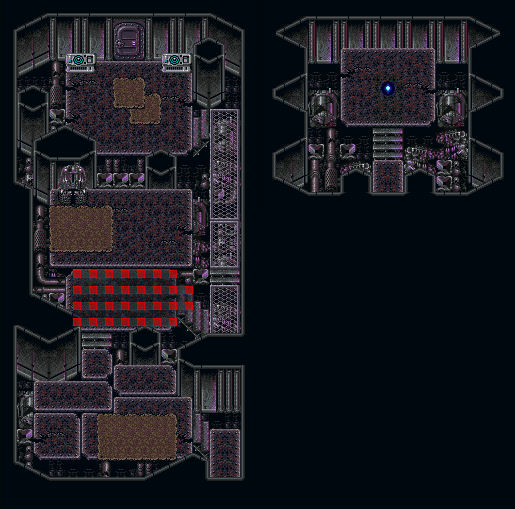 Run left-hall (visit Slash room), then take Midether in right-hall (visit Flea's room). This puts Robo much nearer his battle position. Skeletons obstruct you but they don't have a hitbox. Avoid Omnicrones. Overview: Midtonics at first-opportunity; 4X when Slash goes Up; Midtonic in response; then, Robo hold X after the Slash&FrogCrit. Escape from 4 fights. You can do zig-zag movement to get Robo near his battle position. Redslash: "Run Up+Right against the chain mechanism to 'run in place'; when the 3rd (topmost) guillotine drops, release Right, to clear 1st conveyor." Try not to step onto the 2nd conveyor before Ozzie stops you. Sometimes the 4th conveyor simply doesn't speed up (it feels "laggy"). If it does speed you down through, you can try fast 5th conveyor. But if it's slow, you should probably wait. Ozzie has a Doomfinger (Robo weapon). If you're sheltering before Magus, you can take this for a bit extra damage. Note how when a Roly reaches the end of a segment, and rolls down a bit, you can clip Up to the inside and pass. Beware approaching at the same time as the Roly: you can touch the Roly while it's on the segment above you. There's an exception-spot where they do roll down the inside.. Buffer Run into the room. If you walk for even a frame, you'll want to readjust by push Up against the midroom wall (to squeeze above pit "9"). If you are fast, you can step on THIS SPOT (pictured) and the Bomber will push the 3rd Outlaw. 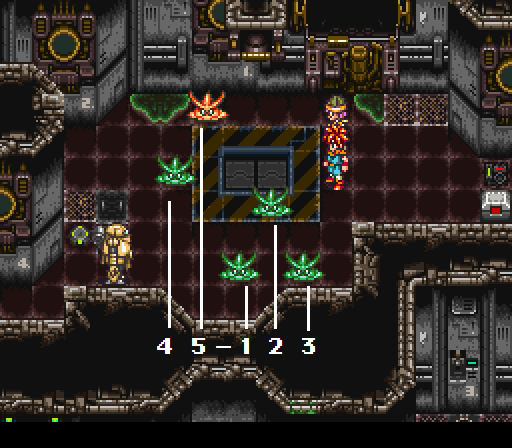 Otherwise, wait for Bomber to pass and get Robo/Frog to obstruct the Outlaw. Once the Outlaw moves 2 full steps "out-of-bounds", you can pass. To get the bird-push, run up to the bird's platform as quickly as possible (at that Y-position, the bird starts walking Right). The Bomber will collide with the bird for a long enough duration to make the bird walk Down for 2 moves. If you run up behind the bird fast enough (cutting the corner even while the bird obscures it), you can de-spawn the final Bomber. Else, simply clip up past it. Backup: "11" count . . (2.45 - 2.7) !! Fadeout all the way to the club man (end of the dark-ground surrounded by light ground). Try to glimpse Ayla & Chief. If you fail this fade, you won't know til the top of Dactyl Nest…! 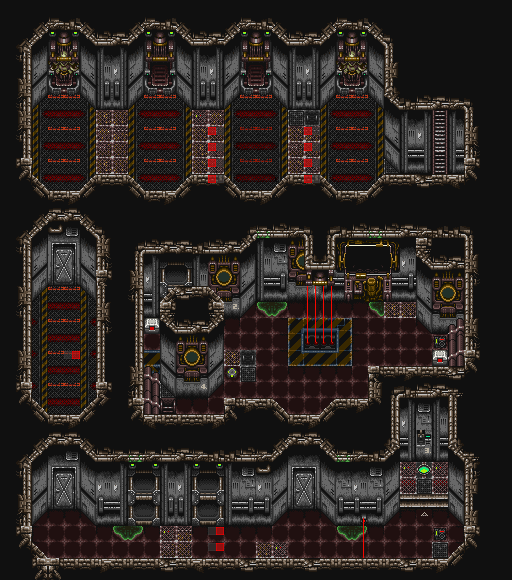 Buffer Dash into the room (move in 2-pixel multiples): there's only 1 X-coordinate that works, and this helps you visually distinguish between the correct pixel versus too far left/right. Line up Crono's hair with the grass of the Shist; run Up. After Mesomail ladder, continue buffering Dash for double-pixel movement, and clip Up at the end. 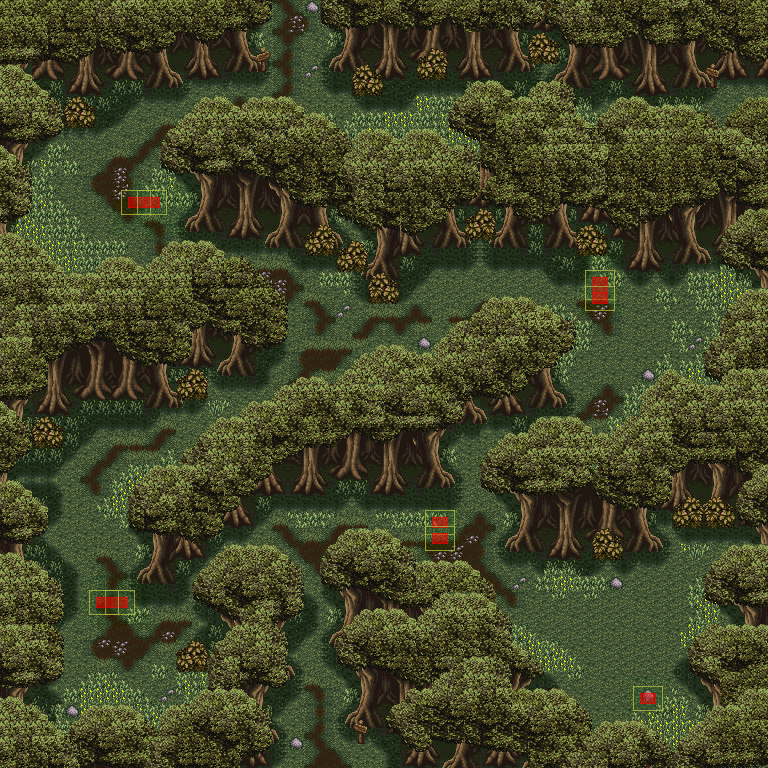 Place Crono's foot right on the square "chunk" in the dark heart-shaped grass; run Up. If you succeeded the Laruba fade (! ), game will pan camera immediately. Else… climb all the way back down to Laruba. For 1st skip, you can check for the dark grass-shadow ending above hair-part. Clip Up the right-side torch to get aligned. There's a fight trigger directly in front of the right-side skull-entrance: be sure to go over above it. 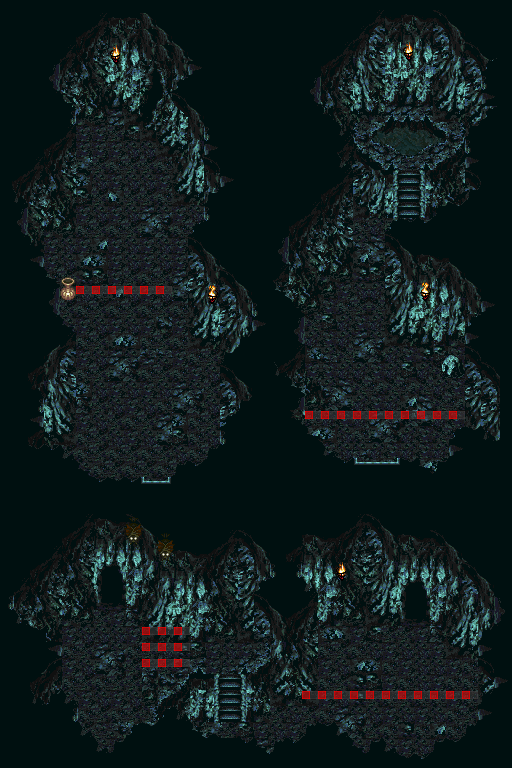 Buffer Right, immediately hug the top wall til you reach the gated door. Run down and cross Right along the "hats"
Buffer Left+Down into the room. Hug the upper wall again, to align vertically for skip. Run straight Up to engage. Attack + Firesword3 … "5"
Attack + Firesword … "4"
Attack + Spincut … "3"
Attack + Firesword … "2"
Attack + Spincut … "1"
Attack + Firesword … "Q"
Attack + Firesword … "5"
( Spin, FS, Spin, FS, Spin ) … "1"
If you do not close ALL of Plant Lady's texts before exiting the room, Sunken Desert will not open. 🔄 Swap: [Y] Frog A. Save & Load: Bright load . . .
react fast to Frog's ready! 🔄 Swap: [Y] Robo A. Save & Load: Mash load . . .
1. Mash Load. Wake up Gaspar and do the breakaway…. 2. Go Left over the bridge. At the middle of the bridge, Gaspar's text will begin to close: open Menu quickly to interrupt it clearing… Close menu (buffer Start+B to do so), and begin holding A. Move only across the 2 left-most pillars (to "collect" them); cease holding A. 4. Tap A, and pause-unpause to try to hit a good frame. If you manage to pause on a good frame, press Start+A exactly together, and hold A to close 2 texts (2300 and 1999). Go to "Bangor Dome" 2300 A.D.? 5. 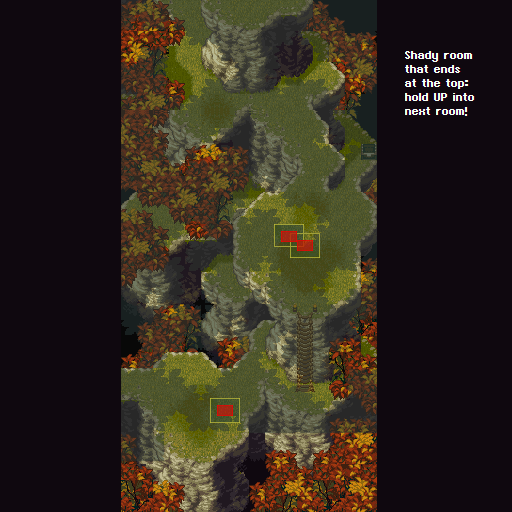 As the 3rd text (65,000,000) is writing out, watch P3's position compared to Crono. 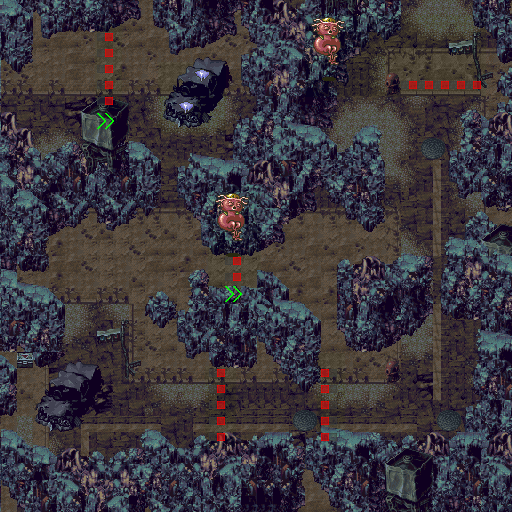 Right when P3 groups up, Crono faces Down: tap A right there (can be a 4-frame or 8-frame window)… Crono hopefully begins to "zip" to the left. You can open/close menu as he follows his course (P2 should NOT chase, else it's a failed attempt). 6. 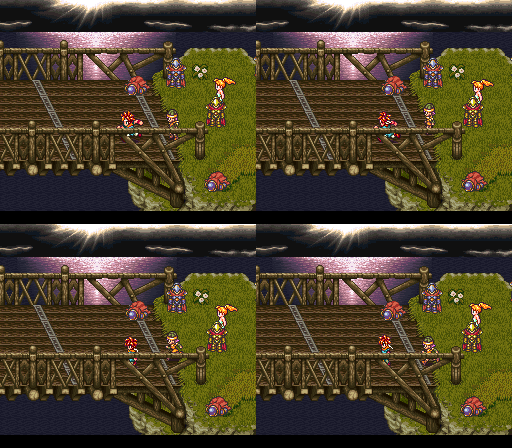 Just as Crono reaches the corner of the pillar-area, coming back inside the fence, swap any 2 characters (using Y menu or X menu) to cancel his 1st zip… Crono will immediately begin a 2nd zip: close menu and mash X/Y until you hear a shimmer noise or see him begin to move. Swap any 2 characters (using Y menu or X menu) to cancel his 2nd zip. Backup: Mash Load . . .
[A] once to open menu. No double-tap!